Hapsa Khan was born in the Kurdish city of Sulaimania to a prominent family in 1881. She later married into a revolutionary family to Shaikh Qadir, brother of Shaikh Mahmud. She is believed to have been the first woman in Sulaimania to stress the importance of education for women as a means to gain freedom. She was active during Shaikh Mahmud's autonomous government in the early 1920's and was a supporter of the nationalistic cause. She established what is considered the first Kurdish women's organization in Iraq. She pursued an agenda for the progression of Kurdish women, especially in gaining access to literacy and education. "Every afternoon she receives in her courtyard all the women who want to learn by her wisdom and who want to discuss the problems of the day with her. They live separated in the house but are often quite powerful as far as their husband and family is concerned." Hapsa Khan's father used his house as a place for intellectuals in the community to gather and discuss different topics. After her father's death, Hapsa Khan turned the family house into a public meeting place and became the leading figure at home. Her visitors ranged from writers to artists, to men of high rank. 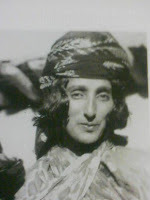 In an interview with Shaikh Mahmud's niece, Drakshan Jalal Ahmad, published in Kurdistan in the Shadow of History, she mentions that Hapsa Khan said, "There is no difference between men and women...so I am going to continue..."
"Some people were angered from a religious point of view that she was imitating a man, but she did not stop." "Shaikh Mahmud himself said that if she had been a man, she would have been a strong challenge." It's evident that she possessed a strong character and was adamant in continuing what she believed in. After her death in 1953, her home, as she had intended, became a school.